It’s feijoa season again! One of my favourite fruits, feijoas have a unique flavour that’s hard to describe – half pineapple, half kiwifruit, and another half citrus. 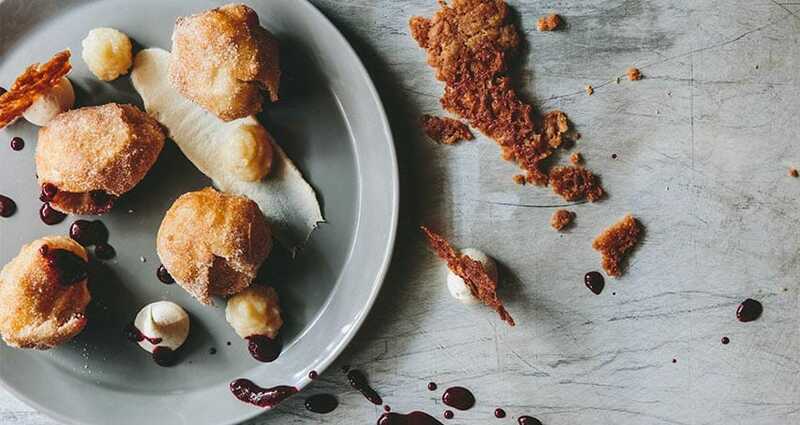 This year we’re taking a simple bakery classic – doughnuts – and making it our own by serving them with roast feijoa, vanilla custard and blackcurrant. The doughnuts themselves are little yeast-risen buttermilk ones (all baking is better with buttermilk) served hot, tossed in cinnamon sugar and filled with feijoa & apple jam. The feijoas are roasted in Riesling, sugar and vanilla until tender, then chilled in their syrup to let the flavours mingle and develop. The custard is made how it should be; nothing but cream, sugar, egg yolks and a split vanilla bean. So far, this dessert may sound a little unhealthy (well, it is a dessert) so we’re cleverly offsetting this by finishing the dish with a coulis of organic blackcurrants from Goodies From the Gorge. There you go – vitamin C! One word of warning though; we make these doughnuts fresh every day in limited quantities and, since it takes four hours to make them, once they’re gone they’re gone! So be sure to ask for some to be reserved for you as soon as you come in to avoid disappointment – nothing is sadder than being denied your doughnut!